The project’s RAFT rubric: DunesRAFTrubric. 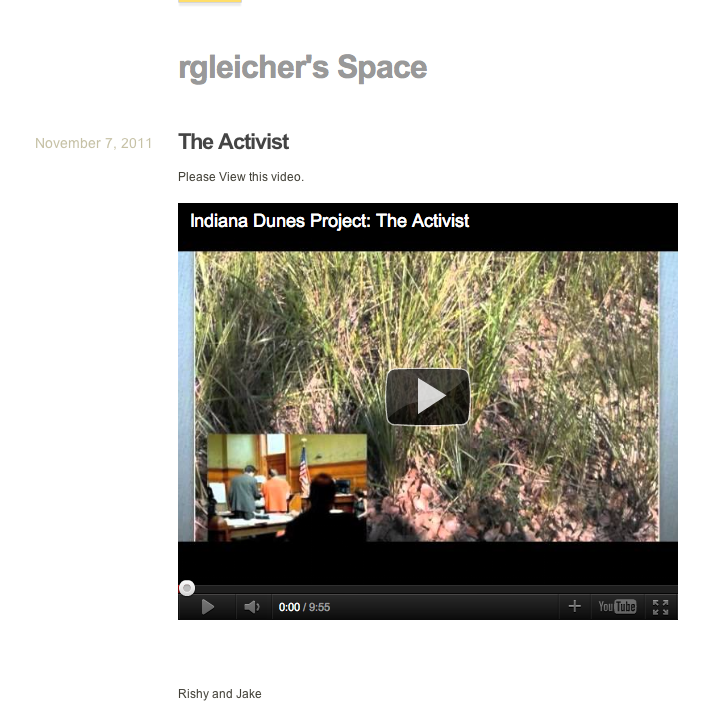 Her students went on their field trip to the Indiana Dunes in September and have now completed their projects. 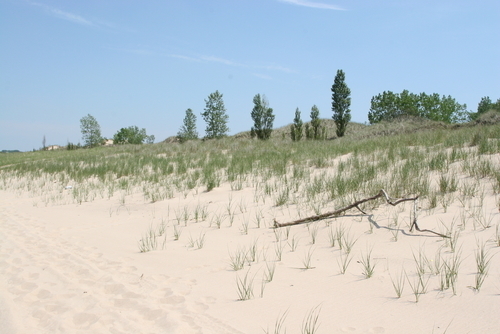 The assignment was to tell the succession story of the Indiana Dunes to an audience of your choosing (making a connection between you, as the narrator, and your audience). The students had multiple web 2.0 tools to choose from when creating their story – some created digital books, some shot video, some created comics, and still others did VoiceThreads. You can find the students’ posted projects on their class blog site (pictured above). Without exception, they are creative and wonderful expressions of the students’ understanding of succession. I was truly impressed by how much time and effort the students put into their work. One of Ruth’s observations, now that the project is complete, is that she feels she has a much better handle on what her students know (and do not know) about succession. In other words, their projects were deeper, authentic expressions of what they knew and understood. Unfortunately, the formative assessment part of the plan didn’t go so well. The students had two weeks between posting their project and the point at which Ruth would grade them. She encouraged them to comment on each other’s work and recruited a few other biology teachers to post comments. Most of the students got 2 or 3 comments but, unfortunately, they didn’t respond to them nor did they opt to revise their project in light of the feedback (even though there were some specific issues to address). Ruth’s take is that this formative assessment loop is not a familiar path for her students – once an assignment is turned in, that’s the end of it. She’s eager for ideas to help encourage this important aspect of the project so if any of you have suggestions, please comment below – we’d love to hear them. I also wanted to reflect on the way that Ruth and I have been working together. It’s interesting to tally up the many ways Ruth we productively used new media tools as we worked. Skype: Ruth and I used Skype for our planning conversations and for the interviews. Since the voice were coming through my computer, I could easily record the conversation and then post the recordings online. WireTap: I use this regularly to record audio – it’s a wonderful, versatile, and fool-proof piece of recording software. Google Docs: Ruth posted all of her student worksheets and rubrics as Google Docs which made it easy for me to edit and add suggestions. It also made it easy for the students to access them – they could either save and then print them as PDFs or Word docs, or they could save a copy and create their own version of the original, also a Google Doc, so they could modify it, write in their answers, online. Having the activity’s documents online will also make it easy for Ruth to share her work with other teachers. VoiceThread: A few of the students used VoiceThread for their projects. They uploaded digital images taken on the field trip and added their own narration to the images to tell their succession story. Issuu. Quite few of the students used Issuu for their projects to make online books – Ruth’s speculation was that this was the easiest of the tools for the students to use and required much less work. Pixton. A few of the students created comic books, using Pixton, for their projects. This was the tool that Ruth was first drawn to. She particularly liked the way you could add comic drawings to real photos to tell a story. Posterous. Ruth used this free application to create a publicly accessible blog site where her students could post their finished projects – all in one online spot – so that others could see them and comment. By posting the projects and specifically marking out time for peer review, Ruth is emphasizing important elements of the scientific process (as well as good writing) – multiple drafts, reshaping one’s ideas based on the meaningful input of peers and outside experts, editing, proofreading, and refinement. And since the projects are all online, and easily accessible, she’s erased the boundaries of the 50-minute class and the limits of getting feedback from those in attendance at Niles West HS. Thanks, Ruth – it’s been a really good learning experience and great fun as well! I’ve been shadowing Ruth Gleicher, AP Biology teacher at Niles West High School (in Skokie, IL), for the last few weeks as she re-imagines an ecological succession project with her students. 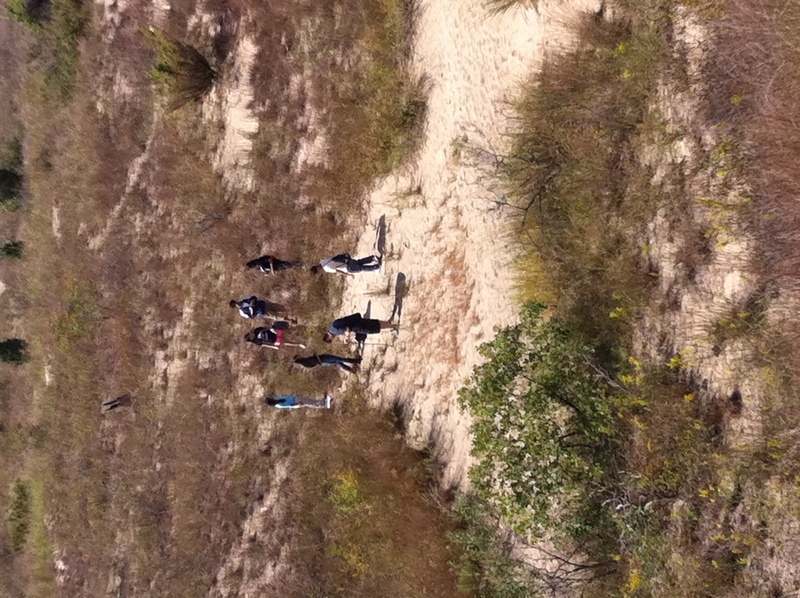 This week, Ruth and her students went on their field trip to the Indiana Dunes (that’s them in the photo above). Ruth has altered the project from the paper brochure she required her students to create in years past to a menu of possible digital projects (a video, an online comic book, a VoiceThread, or a digital storybook). She has also included a formative assessment stage, where the students storyboard their project before building it. Ruth hopes that the assignment’s redesign will help spark their imaginations, encourage their creativity, and facilitate peer review and networked sharing. Ultimately, Ruth believes that this new approach will help the students more fully grasp and understand the concept of ecological succession while helping her better assess and diagnose their misconceptions and gaps. The student image collection: ImagecollecitonforDunesTrip. To sum up the project’s timeline…. One of the many things I admire about Ruth’s plan is that she’s made room in the schedule for input and refinement. There are two weeks between when the students post their projects and when she evaluates them. Projects will appear on the class blog site, comments are encouraged, and the link will be shared with other AP Biology teachers and content experts. Based on the feedback they receive, students have the opportunity to refine and improve their projects. With this interesting addition, Ruth is modeling the network effect at its best. Wonderful. In order to give you a better sense of what Ruth Gleicher is undertaking for her AP Biology course, we decided to record a few conversations between us about this new project for her students. In this first interview, you can hear Ruth outline her goals for the project, how its worked in the past, what her concerns are, why she wants to change things, and what she hopes to do going forward. Ruth and I will record other conversations to document her planning process and, eventually, the outcomes. So stay tuned!